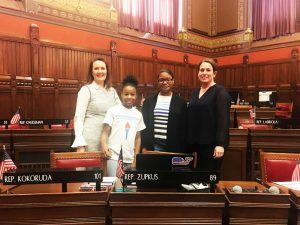 HARTFORD- State Rep. Lezlye Zupkus (R-89) met with kids from the Boys and Girls Club of Greater Waterbury, Kyla Henderson (left) and Janele Lawrence (right). Zupkus encouraged Club members to aim high and try to reach their full potential by achieving academic success, leading healthy lifestyles and contributing to their wonderful communities. Also pictured (far right) is Karen Senich, of The Boys and Girls Club of Greater Waterbury.